Established in 1883 as Heaton Norris Rovers, in 1890 the name was changed to Stockport County to reflect the town gaining County Borough status. After winning the Lancashire League in 1900, the County gained admittance to the Football League, drawing their first match 2-2 away to Leicester Fosse (now Leicester City). After finishing in the bottom three in their first four seasons, County failed to gain re-election in 1904 and so spent a season in the Lancashire Combination; they won the League at the first time of asking and made an immediate return to the professional ranks. County would be proud Football League members for more than a century. Joining the League meant the club soon outgrew their ground behind the Nursery Inn on Green Lane in Heaton Norris and, in 1902, they moved south of the River Mersey to Edgeley Park, then home of Stockport RLFC. County have played there ever since. Having played in a variety of kit colours in the club’s early years, usually a variation on blue & white, County switched to white shirts and black shorts from the ’30s until the mid ’60s. Throughout this period they were often referred to as the Lilywhites. In 1965 flamboyant chairman Vic Bernard, as part of his GO GO GO COUNTY revolution, reintroduced the Hatters’ famous royal blue strip; colours they still adopt today. 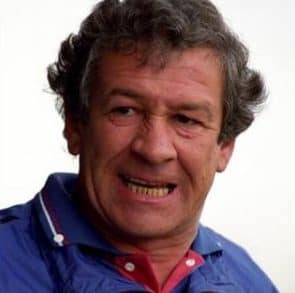 The club stayed in the 4th Division doldrums until the turn of the 90s, when Uruguayan manager Danny Bergara turned the Hatters into regular top-of-the-table challengers. Promotion cam e in 1991, and was followed by four visits to Wembley in two years – twice in playoff finals, twice in the Football League Trophy. Unfortunately County lost on each occasion. Following Bergara’s departure in 1995, Dave Jones took charge and gave the club its most memorable season. In 1996/97, the Hatters won four games against Premiership opposition, including a 1-0 win at Middlesbrough in the League Cup semi-final – unfortunately, the tie was lost 2-1 on aggregate. Other runs in the FA Cup and League Trophy meant County played almost 70 games that season, and finished 2nd in the Second Division – the large amount of games almost certainly costing them the title. After Jones’ departure for Southampton, County consolidated in the First Division until relegation in 2002. What followed was a largely downward spiral back to the bottom division, twice finishing a season on just 26 points, and by Boxing Day 2005 County were well adrift at the bottom of the Football League. In came former player Jim Gannon as manager, who led the team to a remarkable run of form and, with an incredibly tense 0-0 draw on the final day against Carlisle, eventual safety. This was followed by a promotion push in 2006/07, when County memorably set a new professional record of 9 consecutive wins without conceding. But promotion was just out of touch, with a playoff place being denied by Bristol Rovers in the dying minutes of the season despite County winning 5-0 at Darlington. That success finally came the next season. After finishing fourth, Gannon’s side beat Wycombe in the semi-finals followed by a thrilling 3-2 win over neighbours Rochdale, finally ending the club’s hoodoo at Wembley. Unfortunately, the Hatters couldn’t build on that success and went in to administration before the final game of the season at Brighton. In 09/10 administration took its toll, and County finished on a new record low of 25 points and were relegated back to the bottom flight. In the summer of 2010 the club was taken out of administration by a group of local business people, ensuring the club’s survival. However, fortunes took a downturn on the pitch and the Hatters finished bottom of League Two, meaning that they would compete outside the Football League for the first time since 1905. 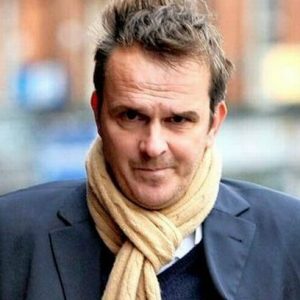 During 2011, Liverpool-based businessman Tony Evans headed up a consortium of new investors in the club, who appointed former German international Dietmar Hamann as manager. However, following the consortium’s failure to take charge, Hamann’s squad struggled in the league and in November he was replaced by former manager Jim Gannon. The size of the task ahead of Gannon was even bigger than the one in 2006, and the team initially continued to struggle but found resurgent form in Spring. Safety was secured with a 1-1 draw at home to Braintree, allowing the Hatters to enjoy a peaceful summer for the first time in four years. However, that stability didn’t last long and in 2012-13 more financial issues off the pitch restricted the squad on it. With his team in the lower half of the table, Gannon was sacked in January 2013 and replaced by Bosnian coach Darije Kalezic. Unfortunately results got worse, and with County staring at relegation he was replaced by former Gateshead manager Ian Bogie, but he too could not stop the slide. A 4-0 defeat to Kidderminster Harriers saw Stockport County relegated to the Conference North, meaning the Hatters would be playing regional football for the first time since 1905. Bogie left the club after a run of poor results and was replaced by County stalwart Alan Lord. Lord achieved the feat of stabilising a club in free-fall, securing the team’s place in the division – which had at times looked uncertain – and guiding the club to a safe mid-table finish in the 2014/15 season. Lord’s achievement turning the club around and pointing it in the right direction may well prove pivotal in County’s history. Towards the end of the 2014/15 season Lord moved to become Director of Football, and paved the way for the next man to come in and continue County’s progress. In May 2015 County secured the services of Neil Young as manager. Young and his management team, headed by Gary Jones, made their name with successes at Colwyn Bay and Chester City. Young broke several records with his Chester side in the Conference North including achieving the most wins (33), fewest defeats (3), the most points (107), the most goals scored in a season (103) and the best goal difference (+71). Chester also broke the record for the longest unbeaten streak. 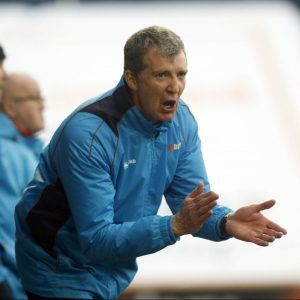 In January 2016, Jim Gannon signed an 18-month contract to return to Edgeley Park following the resignation of Neil Young. Mike Flynn, Dave Conlon and Jordan Felgate were named as his coaching staff. Jim led the Hatters to promotion during his first spell in charge of the club in 2008, winning the League Two Play-Off Final against Rochdale at Wembley. As a player, James became a club legend during ten years at Edgeley Park, earning two promotions and reaching the semi-finals of the League Cup.